The intervertebral discs lie between the vertebral bodies. They consist of a gelatinous, elastic core (nucleus), which is kept in shape by a surrounding fibre ring (annulus). Over the course of normal aging processes or by overloading it, cracks in the fibre ring may occur. Parts of the nucleus pulposus may then be pushed out through the annulus and into the spinal canal. This is known as a herniated disc. A sudden rotational movement of the trunk or heavy lifting can cause a herniated disc. It can also be the result of poor posture in daily life (for example, incorrect sitting or permanent and long-lasting driving), lack of exercise or dehydration. If there is not enough liquid available for the body, also the disc will dry out – and it will lose its elasticity. 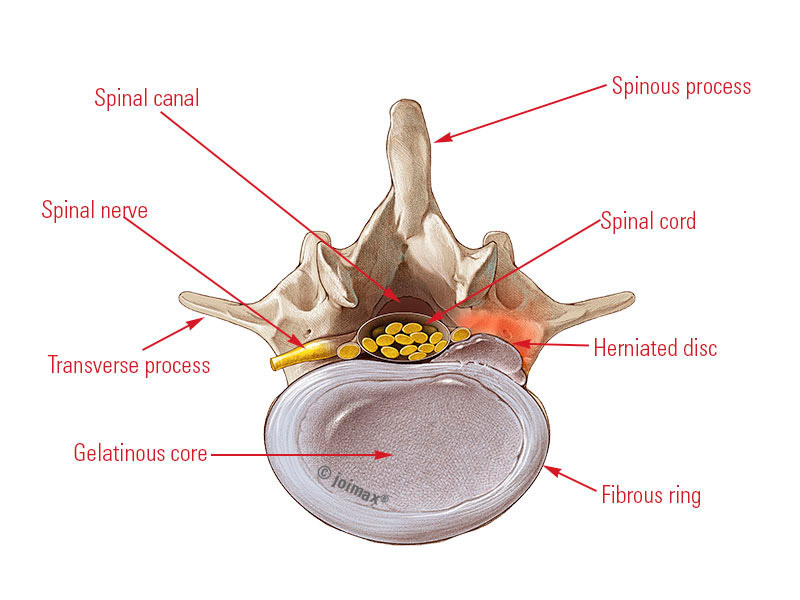 Other risk factors for a herniated disc are obesity, pregnancy, or a general weakness of connective tissue. Not all disc herniations cause pain. However, if tissue from the disc nucleus presses on the surrounding nerves, this will lead to severe, radiating pain, dysesthesia or even paralysis. Most commonly, discs in the lumbar spine are affected. In addition to back pain, they cause characteristic pain in the buttocks, legs and sometimes in the feet. These symptoms are popularly referred to as “sciatica”. Generally, the symptoms of a herniated disc appear in areas that are supplied by the affected nerve root. The technical name of these areas is “dermatomes” and the level of the herniated disc can often be readily determined based on this characteristic distribution of pain. The pain burden associated with a herniated disc is high and it can have a significant impact on the quality of life. Continuous pain can drive people into isolation because often the patients hardly dare leaving the house. A trip with the family or even a meeting with friends will then be a torment. Anyone who suffers from chronic pain (e.g. permanent back pain) should urgently seek medical help. Otherwise there is a danger that the nervous system virtually learns the pain. Scientists refer to this phenomenon as “the pain memory”: ongoing pain renders the nerve cells hypersensitive and eventually they will signal “pain” without obvious reason. Just a slight touch will then lead to pain. The first step towards a clear diagnosis is medical consultation purely based on the patient’s symptoms. In case of persistent discomfort or even a clear suspicion of a herniated disc special imaging of the spine is done. Using magnetic resonance imaging (MRI) cross-sectional images of the spine are created, which are a great help to identify the source of the pain. This gentle, non-radioactive imaging technique makes disc protrusions or herniations well visible. Good results can also be achieved with computed tomography (CT). When do I need disc surgery? Luckily, most herniated discs do not require surgery. Only when the pain does not improve after conservative treatment with intensive physical therapy, heat and pain medications or if paralysis occurs, surgery should be considered. Without question, no one likes the thought of surgery. However, for certain patients, a spinal disc surgery, is the only chance to get rid of their symptoms permanently and to regain their original quality of life. If there are progressing neurologic deficits, paralyses or even organic functional problems like bladder and bowel problems – a quick referral to surgery will be required. In these cases there is a risk that nerve roots may be irreversibly damaged. For all other cases, surgery is recommended only if modern imaging techniques and the pain symptoms of the patient indicate that nerve roots are compromised. During a disc surgery, the tissue that presses on the nerve will be removed. Usually, the pain will disappear immediately. The following rule of thumb can be applied: If the leg pain is greater than the back pain, an intervention may be promising. In pure back pain, an operation often does not lead to the desired results.